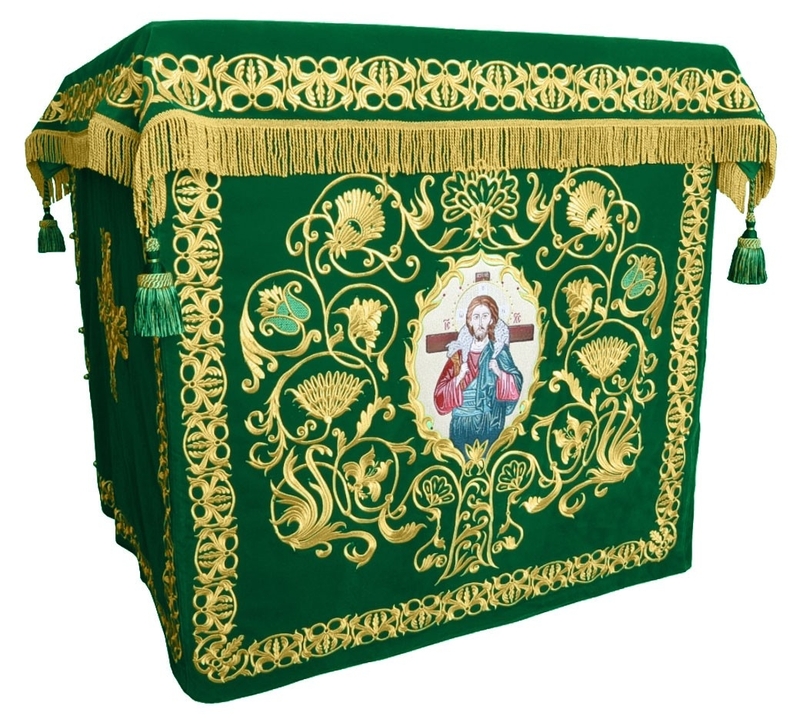 Orthodox Church liturgical Holy table vestments (green-gold) by Istok Church Supplies Corp.
Keeping in mind that the color of the Holy Table vestment changes according to liturgical season and occasion, Istok Church Supplies offers Holy Table vestments in a wide range of liturgical color combinations including green-gold. 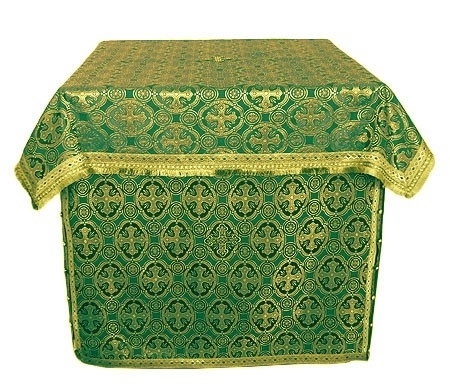 Now customers can select from high quality green-gold Holy Table vestments and truly make the Holy Altar stand out in their Church. We understand that the Holy Altar is the most sacred space in an Orthodox Christian church and the Holy Table, the most important piece of furnishing located there. We offer splendid green-gold Holy Table vestments that are worthy of representing the glory of God’s Throne. Available in both rayon brocade and metallic brocade, these vestments will leave onlookers awestruck. We collaborate with reliable church fabric suppliers to put forward Holy Table vestments in beautiful brocades featuring varying levels of intricacy. While rayon brocades are a popular and cost-effective choice, our Holy Table vestments fashioned from metallic brocade are exclusive, premium choices. 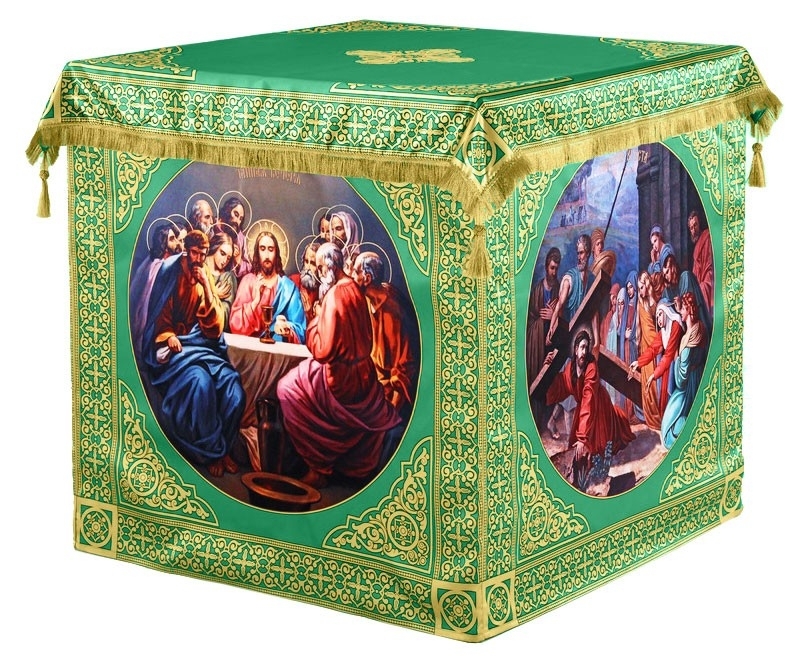 Our Holy Table vestments are designed to fully cover the table and reach to the floor and customers can upgrade by adding premium decoration and velvet inserts to their order. 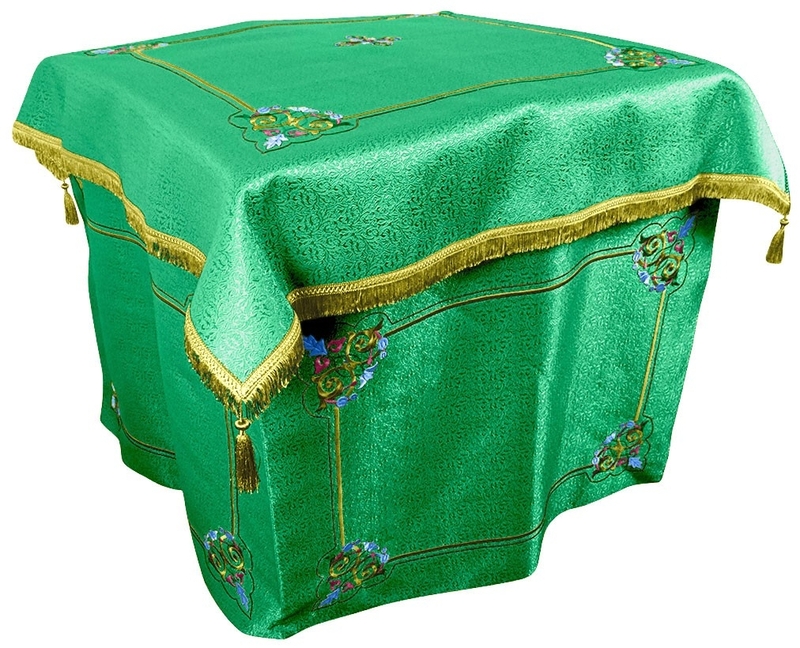 We are also happy to offer a selection of embroidered green-gold Holy Table covers constructed by our talented and deeply religious craftsmen in Europe. Designs for these range from simple to lavish, with rich embroidery bringing to life different facets of Orthodox Christian teachings. Customers can rest assured that we use premium quality fabrics and threads for our hand-embroidered Holy Table vestments while paying close attention to workmanship. Our stringent quality control policy ensures that not a single thread or stitch is loose or out of place. Your search for a fairly priced, exclusive green-gold Holy Table vestment stops here! Browse our collection and place your order at the earliest!